In May of 2015, the Miller Creek Watershed Stewards applied for a grant from the Marin County Fish and Wildlife Commission to facilitate the Dixie Outdoor Classroom (DOC) project led by Debra DiBenedetto, Second Grade teacher at Dixie Elementary School. The Commission awarded the DOC $4,340.00 in September 2015. With this money, the DOC purchased gardening tools, wagon/cart, jute netting, gloves, (4) wood benches, (2) sheds and numerous native plants, etc. With the assistance of numerous parents, 2nd grade students, volunteers and Miller Creek Watershed Stewards, the area was cleared of dead trees, African Blackberry bramble and non-native plants. Subsequently jute netting was laid and the area was seeded with grass and native plants were placed around the grounds of the classroom. Benches were assembled and placed in the classroom area for student seating during class time. In September 2016, a subsequent request for funds was submitted to the Marin County Fish and Wildlife Commission for the DOC and was awarded $2,909.00. 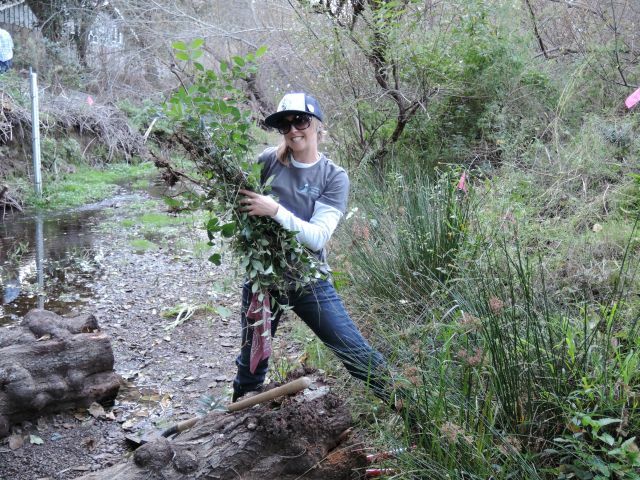 With these funds, the DOC purchased additional native plants, irrigation pipes and Driwater gel packs. In September 2017, a subsequent request for funds was submitted to the Marin County Fish and Wildlife Commission for the DOC and was awarded $3,057.00. The DOC requested funds for additional tools, wood for a platform, rain barrels, and chicken wire with bamboo stakes to protect the native plants from the animals. In December 2015, the Kelly’s Wishes Foundation awarded the DOC a $1,000.00 grant to construct and install (9) signposts along the path leading to the DOC. These sign posts identify the native plants that have been planted by the DOC students and volunteers. In June 2017, the County of Marin Board of Supervisors awarded $1,500.00 to the DOC to replace the (2) sheds that had been vandalized over the 2015 school holiday. With these funds, the DOC purchased (1) larger and sturdier shed from Tuff Shed. With the funds provided to the Dixie Outdoor Classroom through the Miller Creek Watershed Stewards with the Gallinas Watershed Council providing the 501 (C) 3 status through the MarinLink, Debra DiBenedetto’s 2nd Grade Class can now pursue learning about creek restoration and native plant propagation. The success of this program can be heard as the students run onto the DOC grounds hollering with delight when they see that their efforts have produced blossoms and new growth. Miller Creek Watershed Stewards has negotiated with Miller Creek neighbors; Bene’ da Silva, Flood Control & Water Resources; Sarah Philips, Urban Streams Program Manager\, Marin Resource Conservation District; and Marin County Flood Control and Water Conservation District Board of Supervisors to mitigate the clearing of Miller Creek. The mitigation resulted in the assistance of the Flood Control & Water Resources to clear the debris and some dead trees from the Dixie Outdoor Classroom. Both Bene’ da Silva and Sarah Philips volunteered to assist during a work day at the DOC. The Marinwood Community Services District has a maintenance shed that needs to be replaced. It is sitting on the edge of Miller Creek and is in great disrepair. During the winter rains, a drainage ditch runs water through the maintenance shed before falling into Miller Creek. This drains the shed’s debris into the creek. The CSD would like to replace the shed. The Miller Creek Watershed Stewards has presented to the Marinwood CSD Board of Directors their support to replace the shed with a new facility further away from Miller Creek. The Marinwood CSD is preparing a request for funding from the County of Marin. please consider becoming a Steward of the Miller Creek Watershed. The control of further bank erosion is of prime concern and is one of the major goals for the Miller Creek Watershed Stewards. Bank erosion in mainstream Miller Creek is widespread, as the channel is deeply incised in many places and in a widening phase. The creek width dictates the amount of bank erosion that may be caused by swifter moving water in a narrow channel.This erosion typically occurs on the outside of meander bends and is characterized by vertical banks with little to no riparian vegetation. In Miller Creek this bank erosion jeopardizes private property and structures. Miller Creek is home to a population of steelhead, a threatened species. This fish is protected within the Miller Creek Watershed. Fishing is only allowed in the ocean and bay. 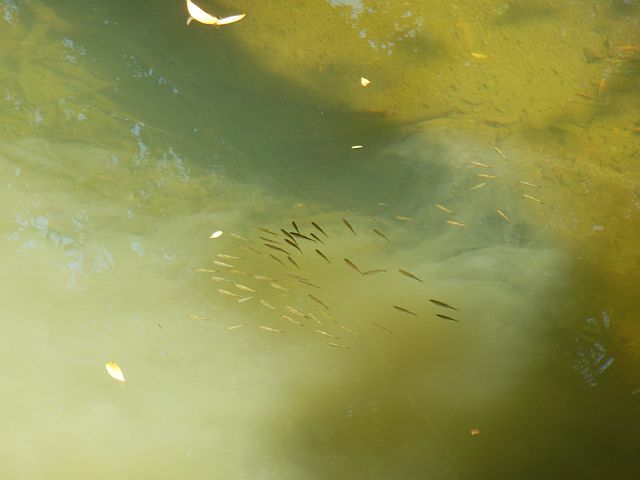 Protection of the habitat and young fish in Miller Creek helps ensure their survival. While rainbow trout are called so because of the bright red stripe found down their sides, the steelhead variety loses this luminescent marking when going out to sea. The journey to sea and the lifestyle requirements there also allow the steelhead to grow quite a bit bigger than the rainbow; while trout that spend all of their lives in fresh water typically grow anywhere from 12 to 36 inches long, steelheads will be between 20 and 40 inches long. The largest steelhead caught was landed in Alaska, and weighed in at 42 pounds. Steelhead salmon are actually considered the normal occurrence among rainbow trout; it is the rainbow which remains in fresh water that is the anomaly. Both steelheads and rainbows are prized by anglers as big fighters when hooked; they begin to jump almost immediately after feeling a barb, and landing one is quite a feat. Because of their value, and because of their unique taste, steelheads have been introduced to more water systems than any other fish; their habitat now extends east to the Great Lakes regions of North America. To more effectively manage grant applications it has been decided to turn control of the Miller Creek Watershed Stewards over to the Gallinas Watershed Council (GWC). GWC has an arrangement with MarinLink to process their funds and receive the benefit of a 501 (C) 3 Federal Tax status. For further information please reference the GWC website at Gallinaswatershed.org.